Sometimes, we want to go someplace with a romantic ambiance with your lover. Many places in another country could offer you romantic places to go. Some of them already well known, let said like France. What people don’t know is, there are many places in Russia that could also offer you with such a romantic and calm ambiance. Especially if you come by during fall, or should we say autumn season. With its old building, also the nature in sight, you could get and feel romantic experience with your lover to another whole level. Fall is the best season to enjoy calmness and quiet places, it also the time for Russian to prepare for long winter. the climate with a temperature that getting colder, but still bearable. Enjoying nature during the autumn season also make for a different experience than in winter or the spring season. Many places, like St Petersburg, also have many cultural events you shouldn’t miss. Going to Kazan during autumn is also a nice choice. Well, if you choose when will you go to Russia, I suggest you try every season to go there, but if you have a tight budget. Its okay, as doing backpacker also could cost you cheaper. From spring to winter, every season in Russia will get you different experience based on the season you go. So why not choose to come to Russia during the Fall? If you are worried about your destination, don’t be. I will provide you with a list of 10 best places to spend fall vacation in Russia, so you could use it as your guide. Well, as one of the famous cities in Russia, what do you expect. 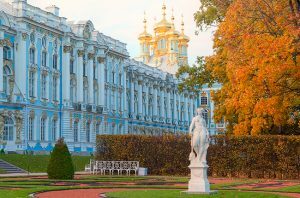 This places could offer you anything all season-wise, but Fall is a season to enjoy the beautiful and romantic ambiance, and Saint Petersburg come to the top of the list. Enjoy the scenery in the canal using some small boat. You could also go to the summer garden which you could see a colorful flower and tree there. sightseeing to Gulf of Finland could also prove to be worthwhile. All in all these places offer you the best you could get in Russia during fall, so i recommend you at least try this one if not all on the list. Located on the border of China and North Korea, it is also the second best places to visit during the fall season. many parks could be found in here. From Pokrovskiy Park, Minnyy Gorodok, Detskiy Razvlekatelnyy Park, Park of Sergeya Lazo, Admiralskiy Skver, Nevskogo, Nagornyy Park, well and many more that I am too lazy to write. The places listed above is the reason I suggest you go to Vladivostok, although the pollution could be bad for the health, well Indonesian people already used to it. Welp, I forgot about the capital of Russia, Moscow. This biggest and beautiful cities also offer you with many tourist spot you desire. You could go strolling in the city, find some gallery museum. r Even better, there is a famous park which called Patriarch Ponds, it is a world-famous park with many tree and ponds, could you already imagine the view? You may never hear of this city before, well, now you have heard it. Although not famous, Novosibirsk deserves to be listed here. The scenery, especially during autumn, is great, you could see the golden sunset shining its last bit of rays to the silver dome and Opera and Ballet Theatre, the largest theatre in Russia. You could also enjoy swimming in the OB River, which i don’t suggest if you weak to cold, or just enjoy the scenery from the shore. A city with a high population and many awesome landscapes. You could also enjoy many things here, in September which is around the autumn season in Russia, you could see many festivals. This is a religious city than another with Muslim, Christian and many more. so respect every people there that upholding the diversity. When you go here, of course, your places to enjoy is the Volga river, it is really beautiful during the autumn season. Why did I say Volga river? Well, there is many things to see in addition to the beautiful and romantic scenery, such as Caspian lotus flower, the sturgeon fish, and also the legendary Caspian flamingo. Even better, you can enjoy many region culinary diversity they could offer, such as Azeri, Persian, Kazakh cuisine. traveling to Russia without enjoying Lake Baikal view is a waste because the scenery it provides every season always beautiful. although you couldn’t swim during autumn because it will be too cold, still the scenery is quiet beautiful. What more, you could enjoy it without too many people come by. North Ossetia is one of many places in Russia, that could offer you with picturesque area especially in autumn season. flora and fauna you could found in autumn, in addition to wild mountain dan gorge. But still, you will enjoy this places to the fullest if you do backpack traveling. Located in the northwest region of Russia, it offers you with a unique mix of a landscape. It is a village situated in the Karelia Republic. Enjoy the scenery in the autumn also with not too many people with your loved one here. Mountain Park and a crystal clear lake will be your places to visit here if you visit St. Petersburg, there is nothing to lose by also visiting this place. Ever see an art park? If not, you should go to Nikola Lenivet. Visit here during autumn and you get a whole packet to enjoy, from its picturesque art to nature it provides you with. All of the art objects apparently is created by Russian named Nikolai Pollisky, and I will not give you picture here, and you should not try to see just the picture. Because what is a better experience during travel than a great surprise. Now that is the list of 10 best places to spend fall vacation in Russia if you ever plan traveling to Russia during fall. I suggest you do a backpacking traveling, although staying at the hotel is one of the options. but doing backpacking an enjoying the nature is what traveling is all about right? And one more point why backpacking is more recommended. You could make friends with a fellow traveler from other countries, see? So many benefits you could enjoy by doing backpacking. but the choice is yours to make, just memorize this 10 best places to spend fall vacation in Russia. Enjoy your trip.